Winnsboro High School Agricultural Science students had the opportunity to participate in a unique hands-on learning experience this week. 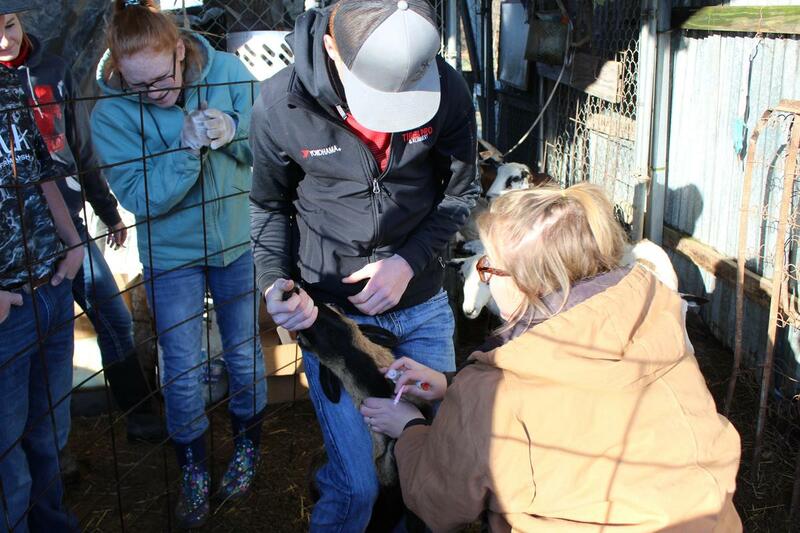 Students in Hillary Davis’ Livestock Management class visited Tejas Ranch in Yantis to assist and learn about taking animal blood samples from sheep on the ranch. The blood samples were collected and will be analyzed using the, enzyme-linked immunosorbent assay(ELISA) testing to detect antibodies that are believed to be genetic markers for a disease commonly known as wasting disease or Johne’s Disease. Davis demonstrated for students the proper way to draw the samples. After a few sample blood draws were finished, the students were given the opportunity to collect the samples themselves, under the supervision of Davis and Tejas Ranch owner, Michael Neighbors. Neighbors expressed his appreciation to students for their willingness to visit the ranch, learn and help him collect samples. He told students that it would be very difficult for him to collect the entire herd’s samples without their help. Neighbors also took the opportunity to educate students about the de-worming process and the importance of doing so. Students were shown how to check the sheep for signs that indicate they need to be de-wormed, then students were allowed to administer the de-worming medicine. Students collected samples from 47 sheep during their visit to the ranch. WHS Senior Darcie Mabry said she enjoyed the hands-on experience she got while on the sheep ranch. “This was such an amazing opportunity for me as a student and I am so thankful that I was able to be a part of the experience,” Mabry said. She plans to attend Texas A&M Commerce after graduation and pursue a degree to become a veterinarian technician. “I feel the skills and experience that I acquired at the ranch will definitely benefit me in my future endeavors,” Mabry added. Davis said the opportunity for the students to work on live animals and gain hands-on experience is invaluable. “Many of the students in my class might not ever have the opportunity to work on live animals. I am so grateful for Mr. Neighbors and his willingness to allow the students to learn on his sheep. He was kind, patient and appreciative.” Davis said.